The sculpture, reaching nearly 20 feet to the top of the fourth floor alcove ceiling, provides a popular resting and rendezvous place for visitors to the National Museum of the American Indian in D.C. Now the sculpture and surrounding walls will also be enhanced with light and animated projections. The landmark, the 2,200-pound tableau Allies in War, Partners in Peace, is a gift from the Oneida Indian Nation of New York. Originally presented to the Museum in 2004, it commemorates the aid the Oneida people gave to George Washington and his struggling Continental Army during the early days of the American Revolution. This fall, the Museum will install an interpretive surround, enhancing the storytelling of the statue with light, sound and projected imagery. The production was made possible by generous support from the Oneida Indian Nation. 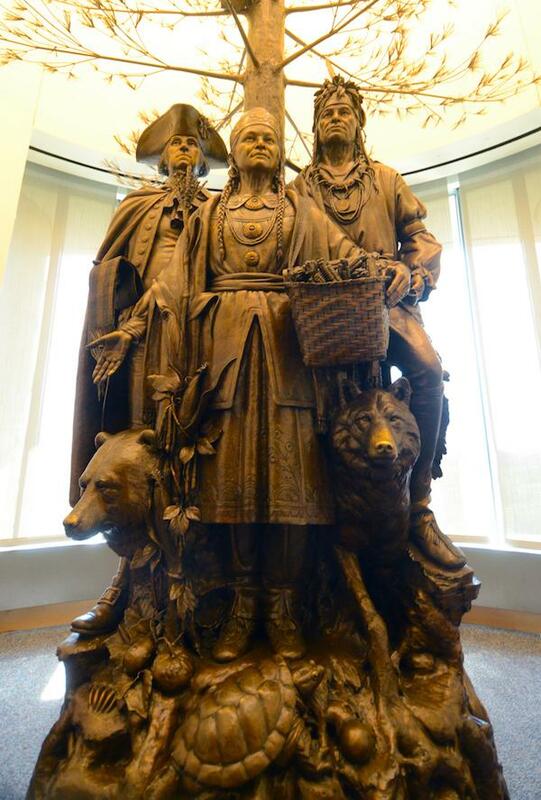 The installation, the work of Utah-based sculptor Edward Hlavka, features three figures from the Revolutionary War, the Oneida chief Shenendoah, the Oneida woman Polly Cooper and George Washington himself. They stand under a towering White Pine tree, emblem of the Great Law of Peace uniting the nations of the Haudenosaunee or Iroquois Confederacy. The Peacemaker who forged the confederacy buried weapons of war beneath the roots of a white pine, and they are visible in the sculpture. This explanatory work will now fall to the sound, light and projected imagery display. It will tell the story of Polly Cooper, who accompanied a group of fellow Oneidas as they walked the 400 miles from their Central New York home to the Continental Army winter quarters at Valley Forge, Pa., during the harsh winter of 1777-78, bringing vital supplies. Cooper remained to aid the troops. The display will also explain the central role of the diplomat chief Shenendoah, also known as Skenandoah or Oskanondonha. The keeper of the wampum and its diplomatic record, he was instrumental in bringing the Oneidas to side with the colonials during the Revolution. 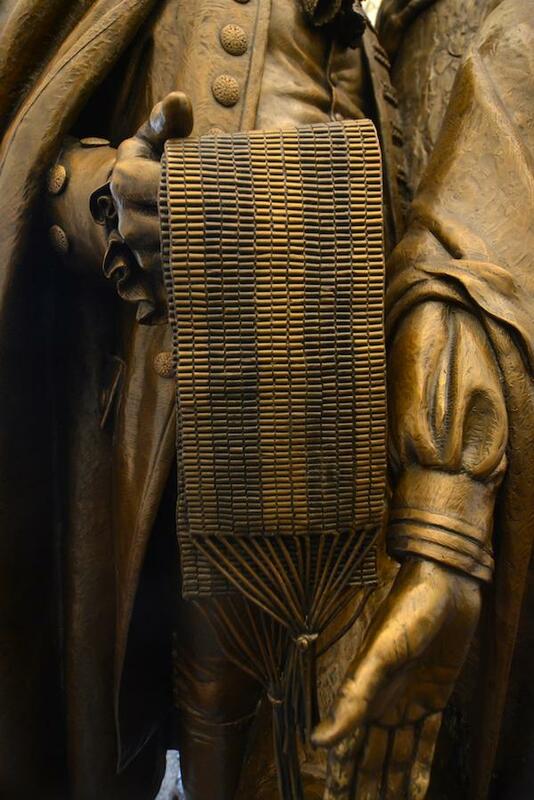 A wampum belt appears in the statue in the hands of George Washington.